CyberFace is aboard Vanguard’s spaceship after having fled there when the White House came under assault by rebel forces. He holds the alien warrior restrained for daring to defy his will by saving Dragon from certain death a while ago. The King of the World is wearing OverLord’s armor and surveys the surveillance footage of the battle occurring on the planet below. He dismisses the renegades as being almost beneath his notice. 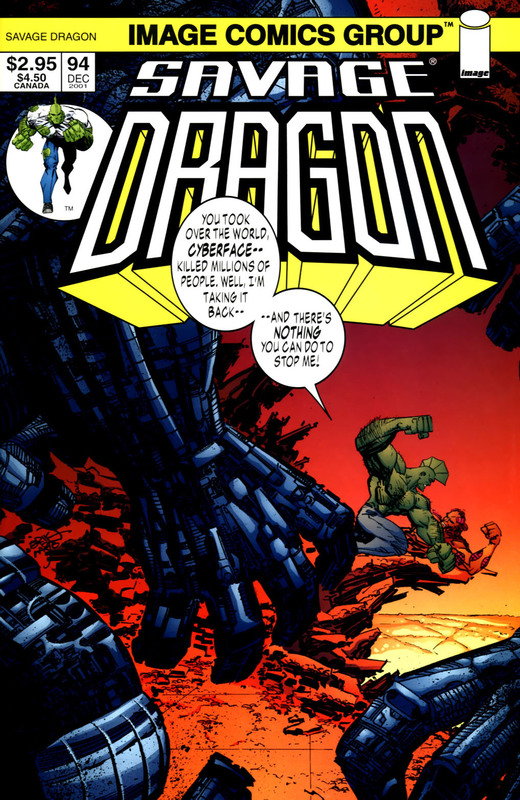 Only Dragon has been thought of as a real challenge and with him supposedly deceased, CyberFace considers methods to use in order to exterminate his enemies. He momentarily thinks about simply blowing up the whole area but does not want to harm those loyal to him. CyberFace decides upon using his Martian flying saucers to shoot at his foes, picking them off like a videogame. He then notices that two of his own agents seem to be fighting one another as Rogue Warrior and SuperPatriot clash. There seems to be something green on Rogue Warrior’s face but before he can take a closer look, the power on the alien vessel suddenly shuts down. Mighty Man bursts out of the shadows and tears Vanguard loose from his restraints before vanishing from sight. CyberFace is shocked by the return of this previously dead superhero which leaves him distracted, allowing Dragon to fire a weapon to disable the OverLord armor’s systems. The bullet he had fired to kill Bad Axe means that Dragon has one less shot than required as he cannot finish off CyberFace. This allows the villain to use his powers to augment the armor, overriding the fail safes and increasing the firepower, sending Dragon running for cover. Down in Chicago, Frank Darling makes his way through the war-torn landscape until a number of shuriken throwing stars are fired around him. Franks calls out that he comes in peace and is recognized by his attackers. Rita Medermade is wearing a Star-inspired costume and is accompanying William Jonson, still wearing the guise of Star. Dragon hopes that the pair is still in possession of something which Dragon will need to help with his plans. Dragon has donned the rocket-boots of Vanguard and uses them to avoid CyberFace’s attacks, taking the fight back to his foe. He is desperate to avenge the deaths of all of those that CyberFace either killed directly or through abandoning them to their fates. CyberFace regains the advantage and impales Dragon with various mechanical devices that he has manipulated with his powers. Mighty Man returns to launch the villain into a wall. CyberFace is fully prepared to kill Mighty Man all over again and hits him with a powerful blast that leaves him crashing down to the ground. Within the White House, the Vicious Circle begins fighting amongst itself for control of not only the group but the world itself. Volcanic hits the Demolisher with her lava as MoreGore is punched aside by SkullFace. The opportunity has presented itself to SkullFace for him to finally lay claim to the power that he has always desired. He vows to claim leadership of the Vicious Circle and use them to become the new King of the World. On their island home in the Coral Sea, Dart approaches Mako about why he has been so depressed since the arrival of their guests. Mako admits to lying regarding the destruction of society and although there really were global attacks by aliens, he exaggerated the extent of their damage. He now fears that once they return to society then Dart will end up leaving him. She assures her lover that this will not be the case but Mako is positive that this will happen regardless. Rex Dexter completes a sophisticated computer virus which will search out and destroy any trace of CyberFace’s presence on Earth. As he activates his creation, CyberFace’s visage appears in his viewing screen and announces that Rex is an arrogant fool. He is literally everywhere and there is no way that he can possibly be exterminated. The laboratory pulls itself apart before wrapping itself around Rex, gradually crushing the scientist.